Thanks to the tiny house craze and a push to build green, repurposed shipping containers have been enjoying quite a moment over the last few years. 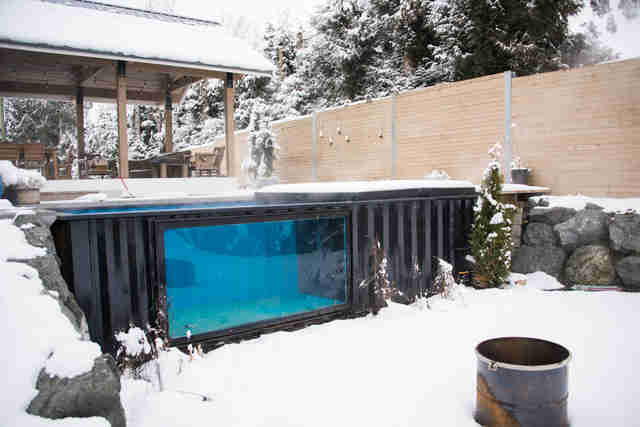 Now, a Canadian company has found a way to breathe fresh life into the trend, by transforming them into fully functional swimming pools that are not only easily delivered to your backyard and set up in minutes, but come with a built-in heating system so you take a dip year-round, no matter what the climate is where you live. Modpools, as they're called, are a unique new addition to the backyard above-ground pool market, though a hell of a lot easier to install (and objectively much sexier) than your traditional circular above-grounders, sporting a sleek facade that makes them nearly indistinguishable from the corrugated steel cargo freight boxes they once were. Available in a range of sizes up to 40-feet long, each Modpool comes with a suite of customization options, ranging from the colors of the exterior and cover, to the addition of glass panel windows, and features like a built-in jet system that creates a constant current to swim against. They also come equipped with specialized water sanitation and heating systems, meaning you can keep the water warm enough to be comfortable year-round (it can allegedly raise the water temp 86 degrees fahrenheit per hour in below-freezing air temps). If you want, you can even turn one end into a hot tub by adding a special divider and cranking the heat just on that side, all of which is controlled via a dedicated app. Unlike an in-ground pool, or even the more standard above-ground options, they're designed to set up in literally a few minutes. And because they were initially built to be structurally sound enough to schlep around the world, they're easily shipped pretty much anywhere (though for now, the company is restricting delivery to the US and Canada). If you're interested, prices start around $27,000, and you can inquire about ordering right here. Joe McGauley is a pool party proponent and senior writer for Thrillist.